Oh Honolulu. This special place holds so many wonders and memories for so many generatons. The pride and history of a nation. The kitsch memoriabilia of a fantastcal island paradise. Immortalized in cinema and in song. Many people visit and see for themselves. Many people only see thru the eyes of others. I myself have seen and now I know; Honolulu is an extraordinary place. 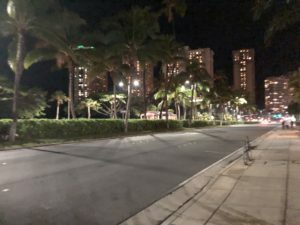 The allure is by no means unfounded as Hawai’i seems to express the joy and kindness of humanity. There is an unbeatable genuineness in the air here, a relaxed confidence. Aloha all around. 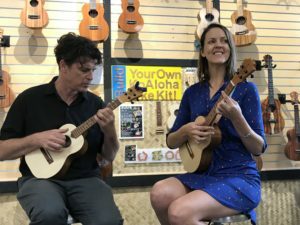 Many of the worlds premier ukulele artsts and teachers live within the city limits along with Ko’Aloha Ukulele, a company which encapsulates all of the remarkable features of this island. 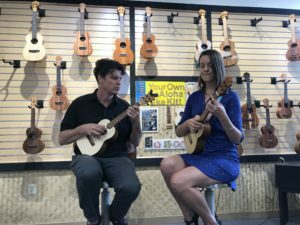 Began 23 years ago from a tiny seed, Alvin “Papa Ko’Aloha” Okami made his first ukulele; 4 inches tall, perfectly tuned and cute as a button. 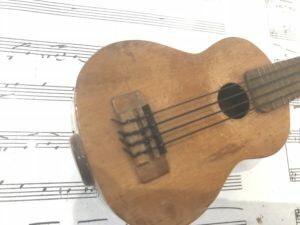 A small wonder, Papa used nothing more than intuiton and his love of music to morph this miniature idea into what is now the most incredible, tonally resonant line of ukuleles on the market. 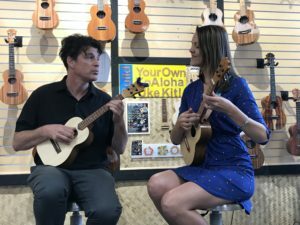 Using the passion of music he’d nurtured thru years of singing and oboe playing, along with the encouragment of his family and the good sense that God gave him, Papa Ko’Aloha began building ukuleles by hand in his small factory outfitted with the typical machines for sawing and shaping. But a good idea always has room for growth and he knew this. Sitting one day holding a small saw in his hand after hours of meticulous digging in the trenches that hold fret wire, Papa decided that with a little forethought he could multiply his productivity while also creatng a consistency in his product. And so he became an inventor! Devising a system of metal plates and sharp circular blades, he set about exacting measurements for a machine that would change everything. Today this inventon cuts up to 18 fret slots in one easy stroke, a system which replaces the painstaking task of sawing each slot by hand, allowing the company to very nearly meet the production demand of their patrons all over the world who covet these incredible masterpieces. 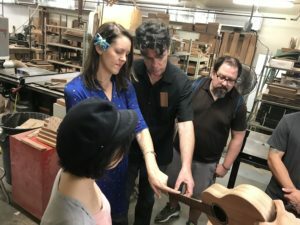 At Ko’Aloha each ukulele is cared for by the team of artsans as if it were made for a king. Every member of the team is trained in every step of the process, giving each journeyman a greater understanding of what eachother go thru, along with what to look for during quality control operations. As the ukuleles make their way thru each step of the process, they come out the other side ready for their auditon. Each ukulele begins as a chunk of ordinary wood. Blocks of Koa are purchased from the Big Island, only after the tree has fallen on it’s own. This is one of the core values of Ko’Aloha; repecting nature and allowing it’s due process. The wood is chosen, cut into precisely measured planks and sent thru to each station. The wood pieces for the back and front are arranged by a process called “Book ending” where a trained artisan inspects each secton of wood with a critical eye in order to pair a piece to it’s adjoining partner creating tonal harmony along with a pattern of continuity and beauty, very much like a Rorschach test or the wings of a beautiful butterfly. In this way the new owner can look into the shape and likely discover something about themselves within the symmetry. The neck pieces are chosen, shaved, sculpted and sanded to a smooth finish. The solid wood side pieces are cut, boiled and shaped by hand.. 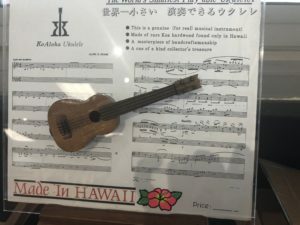 The specialty of this process, I must say, is the circular binding, a skeletal feature that often goes unnoticed to the admirer of the instrument, and is the soul reason for the incredible clarity and resonance that Ko’Aloha is known for. When the structure is complete it’s time for the abalone and ebony inlay on the fret markers, classic headstock logo and, on some models, a classy rosette for the soundboard, the last of which gives some of the ukes an exotic cleopatric allure. The sound hole itself has gone thru an evolution, beginning as an ordinary perfect circle and evolving into a musubi inspired smile, giving the Ko’Aloha brand an individuality all it’s own. Afer each part passes thru the various departments at the factory and is assembled, the little darlings head off to the finish room where they are sprayed and buffed to a shiny finish in order to glisten and shine, awaiting the fates to direct them to their new home. It is only after the full process is complete that the auditions begin. As though Simon Cowell were on the judging panel, the Okami family pull no punches when surveying their creations. Each uke is scrutinized for it’s sound quality and ascthetic finish. 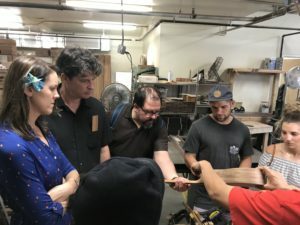 The judging panel listens for consistency in acton height, tonal resonance, and purity of sound, along with a careful scrutinizing of the visual elements and beauty of constructon. 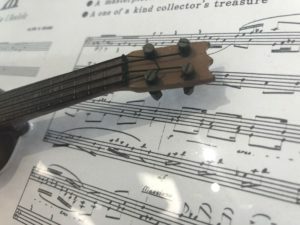 If the audible properties of the ukulele are not up to par, the small creation is ceremoniously destroyed right there on the factory floor, crushed to bits in order to ensure that it never reaches the market. 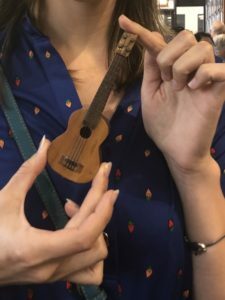 In the rare instances that a visual blemish is discovered, no mater how small, the crafstmen put the ukulele aside to be displayed on the showroom floor for factory tour goers and offered at a remarkable discount. This is the standard of perfecton that Papa Ko’Aloha has insisted on for 23 years and these are the types of sacrifices made to ensure that only the highest standard is met when one dreams of the Ko’Aloha brand. 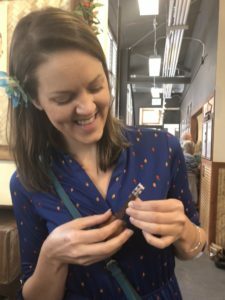 The majority of sweet little stork bundles are sent off to various dealers and distributors around the world, ready to be admired and fawned over by the general public and ukulele lovers worldwide. Beauty, angelic tone, and quality are what set this brand apart. It is what drew me to them, like a moth to a flame. 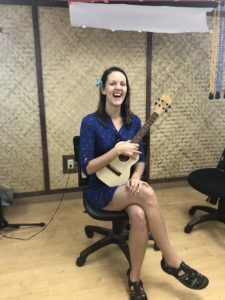 From the moment I gave my first strum on a Ko’Aloha I was smitten and the years since have only strengthened my admiration for this incredible gift. “Ukulele”. Most uphold that it means “Jumping flea”. Some believe the legend that Queen Liliuakalani sanctioned it as “A gift from Heaven”. Once you’ve played a Ko’Aloha you will likely believe the legend.